A school with a confederate flag proudly displayed as part of its tradition; a school whose sports teams wear the moniker "Orientals;" even "Dress Like a Mexican Day" lumped in as a spirit week activity. There's an argument to be made that as long as any culture or tradition is fair game as a subject of mockery, it's fair game. Then there's another line of reasoning that says: that sh*t's racist. What are the most racist high school traditions? There are plenty of offensive mascots in schools around the world and they, along with some insane school traditions, are highlighted on this list of offensive school traditions. Bums Vs. Billionaires is one of the spirit week themes at Plano East Senior High School in Texas, but some think that the students have gone too far. Kids have been dressing up like homeless people - complete with makeshift cardboard signs, tattered clothes, and dirt on their faces - and posting pictures of themselves on social media. Many believe that these students are making light out of the plight of urban homeless people, which is super not cool. Let’s get this one out of the way, because everyone knows it’s coming: lots of high schools have some pretty nasty mascots. Hell, it’s not like the adult world is setting the best example, with the Cleveland Indians and Washington Redskins, but doesn’t it kinda seem like this would be a great opportunity for the new generation to throw their parents’s mistakes right in their racist faces and not do exactly the same thing? Oddly enough, while those blatantly offensive mascots are just now being stopped, one Utah High School wasn’t allowed to change their mascot to the “Cougars” because some women might be offended. Most likely the mothers of most of the football team. But best of all has got to be the Hays High School “Rebel” mascot, which is modeled after a Confederate Soldier and is frequently adorned with the Confederate States of America Battle Flag. Do you think the cheerleaders are dressed like slaves? Come on, you can’t tell me no one at that school has thought of that. 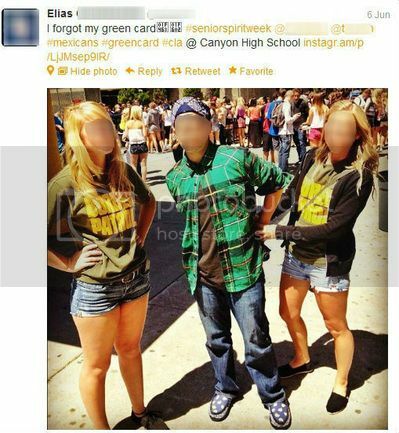 Anaheim Canyon High School in Anaheim, California, recently had to permanently cancel their annual “Dress Like a Mexican” day for their students because of course, they’re going to have to do that. How did this get to last so long? Standard practice among high schools when scheduling their year’s events should be to say “how would this look as a headline?” Or, better yet, “does this happen to resemble any hate crimes?” If their answers include things like “well” or “I mean” or “but,” then they should have to just stop and reflect on their priorities. What purpose did this initially serve? How do Mexicans dress, anyway? Am I this out of the loop on stereotypes? All the kids in these picture look like they’re celebrating “Dress like Totally Normal High School Kids Day.” Have the Latino people claimed cut-off jeans and s**t-brown t-shirts? Is that their thing now? It’s somehow more offensive when people are trying to be racist but can’t even seem to figure out how it works. 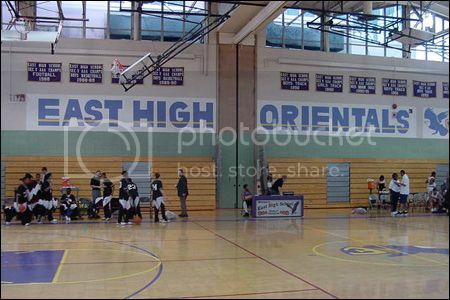 In Akron, Ohio, the East High School was found to be using “Oriental” as their nickname, (presumably because they’re the “East” High School) and have a Mascot of Chang the Dragon. If we’re being charitable, we can assume it’s because they’re unaware that the term is considered racist by the Asian community, and if we’re not being charitable, we can assume it’s because they’re all a bunch of naval-gazing racist c*ckbags. Somewhere along the line, a whole bunch of people just totally missed the idea that it’s not okay to use other people’s cultures as a commodity.